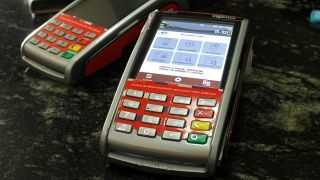 The ability to process credit and debit cards is a requirement for any modern store, but Point of Sale (POS) terminals are usually tied to an internet connection. What happens if you want to sell at a trade fair, or set up a market stall, or any other kind of pop-up shop? This is where mobile card readers come into their own, allowing you to process card payments wirelessly and on the go. You don't need a checkout till, you just need a smartphone or tablet that can run apps to connect with a mobile card reader. They can even be great for small mom-and-pop shops that are looking to keep their initial costs down, and a tablet running apps on a stand can work in lieu of a till. Most merchant services providing a mobile card reader offer rates similar to online payment systems. Many charge no monthly fee, just transaction fees in the range of 2.5-3.5%. However, there are options to pay a monthly fee in order to reduce transaction fees down to interchange fees only, ie, the pennies the bank will charge for movement of funds between accounts. Where mobile readers really come into their own is their sheer flexibility. Using nothing more than your own smartphone, a downloaded app, and a cheap card reader costing around $25-$50, you can be ready to start taking payments anywhere there is a cellular network signal. Even then, some merchants offer an offline option. Even better, it's not just the ability to take payments from credit/debit cards with an EMV aka chip-and-pin, but contactless payments can now also be taken, including Apple Pay, Android Pay, and Samsung Pay. Here we look at some of the merchant service providers who can provide the best in mobile card readers for taking payments on the go. SumUp is mobile card reader that is available in 31 countries, although it is a more recent entry to the US market. Notably, it supports cards with EMV, popularly known as the newer ‘chip cards,’ and is powered via a micro-USB port, and has a lithium ion battery. This mobile card reader solution is well suited to lower volume users as it offers a fixed 2.65% transaction cost, with no monthly fee, or minimum usage level. The card reader is available for a one time fee of $69, and connects via Bluetooth to your smartphone with a downloadable app. There is also support for a wide variety of credit cards, including MasterCard, Visa, American Express and Discover Card, as well as the newer services Apple Pay and Google Pay. Payouts to your bank account take an efficient one to two days. Unfortunately, the card reader is required for any transaction to occur, as transactions cannot be manually entered. Shopify offers an entire suite of merchant services. Here we are focusing on its mobile POS system, that targets selling at “fairs, markets, pop-ups, and everywhere in‑between,” making this an attractive solution for an existing Shopify business on the move with a pocket-sized card reader The chip and swipe reader is also free, sweetening this deal even further. In addition to the mobile card reader offering, this also integrates into Shopify solutions including the Shopify POS smartphone app. However, do note that the mobile reader comes as an extension to existing Shopify services, and isn't provided as a standalone. Shopify offers three plans, with the starting tier being the Basic Shopify Plan costing $29 per month – it also has transaction fees of 2.9% plus $0.30 per transaction. Merchants can opt to pay a higher monthly fee to reduce transaction costs. PayPal Here is the mobile card reader offering from the online transaction juggernaut that brings instant name brand recognition to this space. A definite plus is a low cost of entry in terms of acquiring the card reader, and there are accessories on offer such as a bouncepad and charger to complete a professional package. The PayPal Mobile Card Reader that can handle card swipes is available for an affordable $14.99, and connects to the phone via the headphone jack, with interaction facilitated via a smartphone app. However, do note that it's only intended for sales volumes of less than $500 a month, and anything over this will result in funds being subject to a 30-day reserve policy. A better choice would be to upgrade to one of the other mobile card readers, such as the Paypal Chip and Swipe Reader for $24.99. Alternatively, there is a Paypal Chip and Tap reader available for $59.99 to deal with contactless payments, or a version that comes with a charging stand for $79.99. Intuit, best known for TurboTax, produces the QuickBooks small business accounting offering, and under that umbrella is its mobile card reader effort, which is known as QuickBooks Payments. The GoPayment smartphone app is notable, and this has a companion card reader, both of which come for no additional charge. Unlike free card readers from competing services, this one from Quickbooks Payments can handle both mag-stripe and chip methods of entry, and connects to the smartphone wirelessly via Bluetooth. Another benefit of this service is that there is no setup fee, or any minimum usage level, making QuickBooks Payments more attractive for the lower volume user. Transaction fees are 2.4% plus $0.25 for each swipe, and for a keyed entry this rises to 3.4% plus $0.25 for each transaction. Overall, if you're already a QuickBooks user, QuickBooks Payments could be your priority choice. PayAnywhere is a mobile card reader solution that integrates into the larger PayAnywhere ecosystem. This reader accepts the full range of payments, including traditional magnetic swipe, newer chip payments, and even the latest contactless payments, including Samsung Pay. The entry-level reader is free, connects via Bluetooth, and can do both swipe and chip transactions; an upgraded reader also supports contactless transactions. The notable feature of the PayAnywhere card reader is that it is part of the larger family of PayAnywhere services. These include being able to send invoices from within their app, accepting card payments on your website, and being able to apply discounts to invoices. For the Pay-As-You-Go plan, there is no monthly fee and the card reader is provided free. The transaction fee is 2.69% for swiped, dip, or tap, and for keyed in payments the fee rate is 3.49% + $0.19. If processing orders of over $10,000 a month, discounted rates may apply. Square is another all-in-one merchant service provider, and comes with sleek POS set-up that allows you to treat your iPad as a sales till, running an app connected to one of Sqaure's card readers. Square already do a good offering for online payments, and everything is integrated and comes with analytics. The reader can even be purchased directly from Amazon or Apple. Yet pricing is a standard 2.75% per swipe, dip, or tap, and 3.5% + $0.15 per keyed-in transaction. Fattmerchant provides a mobile card reader that could especially benefit merchants with over a 1,000 transactions per month. Although they charge $99 a month for the service, transaction fees are only $0.15 + interchange fees per transaction. There are also integration options, including with Quickbooks Online, which could be especially helpful in making a purchasing decision. ROAMpay are also worth mentioning, not least because its mobile card reader offers the widest device support in the industry. ROAMpay is compatible with iOS devices running 4.2 and up, Google Android devices running 2.1 and up, and even BlackBerry devices running OS 5 and up. This could make ROAMpay a useful option for merchants who have older smartphones, which may not be able to support the latest apps offered by other merchant vendors.